In this episode, Dr. Jordan Chenkin & Dr. Jamie Blicker discuss positioning, landmarking, and best technique for lumbar puncture, how to minimize post-LP headache and traumatic taps, as well as when CT head is not required prior to LP. 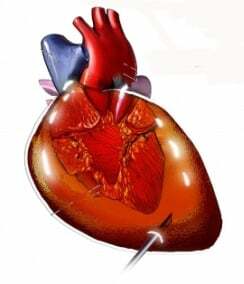 They discuss the indications, contraindications, trouble-shooting and pros and cons of needle aspiration, small bore pleural catheter with Heimlich valve and large bore chest tube for the treatment of spontaneous pneumothorax. 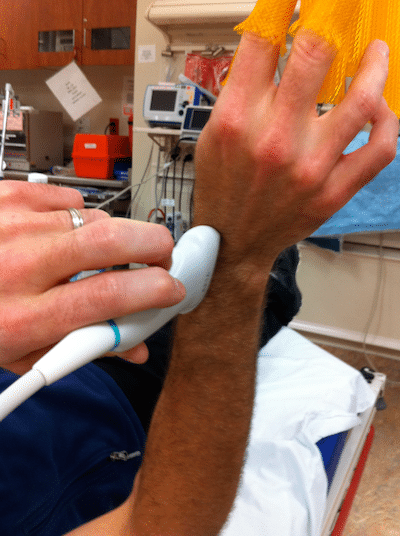 Dr. Chenkin presents an intriguing argument for why he uses ultrasound-guided fracture reduction routinely in the ED, and we end with a few tips and tricks using skin adhesive for some unorthodox indications. Indications for CT before LP? Ultrasound can be used to assess optic nerve diameter for papilledema. The basic technique involves applying a high frequency linear probe on the patient’s closed eyelid with a neutral gaze. Find the optic nerve in the retina surface, and measure optic nerve sheath diameter at a point 3 mm posterior to the retina. >5 mm diameter is abnormal, as is a convex bulge in the optic nerve, which suggests papilledema. What’s the Best Position for LP? There is no evidence that one position is best for the LP, but opening pressures are only accurate in lateral decubitus. This position may also help the patient stay still, and prevents a fall if syncope occurs. Remember to fully align the spine, with hips perpendicular to the bed, and a pillow under the head. If choosing a sitting position, which may optimize interspace diameter, place feet on a stool to flex hips, and don’t over flex the neck. Our experts recommend using lidocaine with epinephrine to create a wide anesthesia field, and inserting the needle through sterile 2×2” gauze. Clean the head of the needle if blood appears at the initial part of the tap to avoid contaminating the entire sample with RBCs from the initial clot. Only reposition/re-angle the needle when it is withdrawn to the skin surface, and consider moving to another interspace rather than reattempting at the same site to reduce the risk of a traumatic tap. Ultrasound can be used if landmarks are not palpable, to improve accuracy without adding to procedure time. 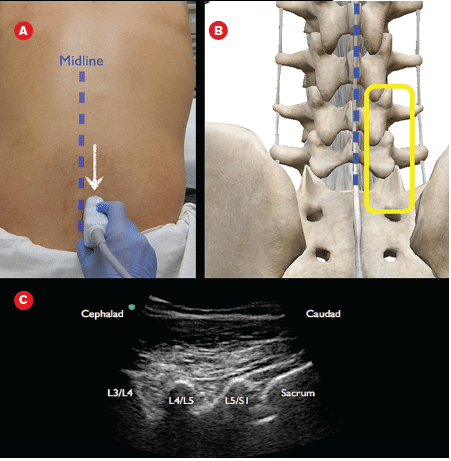 Position the patient for the LP and use curved array probe in the transverse and mark the midline. Then estimate the distance required to reach the ligamentum flavum, and the angle required for the needle, and turn the probe to longitudinal to find and mark the interspace. For certain patients who cannot flex their back, a lateral (aka paramedian approach) may help. Insert the needle 1 cm lateral to the midline, and direct it slightly cephalad and medially to reach the midline. Asymptomatic patients without lung pathology who have a small (only observation and a repeat CXR. Spontaneous pneumothoraces that are larger or symptomatic, or secondary to lung pathology should be treated. For primary pneumothorax, evidence suggests needle aspiration is noninferior to chest tube drainage. A 14 or 16G angiocath connected to a 3 way stopcock can be used for serial aspirations with a large syringe. Pigtail catheters/small bore pleural catheters with a Heimlich valve may be used instead. They produce less pain than a chest tube, and allow for outpatient management, however they tend to kink, clog, and displace so require careful insertion and followup. An outpatient protocol using small bore pigtail catheters demonstrated >80% success rate for resolution and patient discharge home. Cortical and cortex disruption shows up well on ultrasound, thus ultrasound can be used to visualize occult fractures (sternum, scaphoid, rib), to guide needle positioning for a hematoma block, and to verify success of fracture reduction. Using ultrasound may improve success of fracture reduction. Perform the reduction and recheck the fracture appearance (before splinting) to verify success. Dr. Helman, Dr. Chenkin and Dr. Blicker have no conflicts of interest to declare. Thanks a lot for the talks. I like the phish as well. I was wondering if next time you talk about LPs you could comment on how long people wait for equilibration to record opening pressure and relation to needle size (so if you are using one of the small 26g needles how long do you wait?). Also you could ask the guests about effect of positioning on pressure reads. Anyway thanks again.